The new Ford Focus Electric is a popular compact EV that has been getting a lot of attention these days. These are a few features that make this electric car such a stand out. When you are trying to drive up a large hill, the Hill Start Assist feature makes certain there is no chance the vehicle begins rolling backward in between you depressing the gas and brake pedals. This feature gives the car that added boost to keep moving forward despite the incline. The Electric Power Assisted Steering in the Ford Focus Electric gives you precise control over the car in any driving situation. You'll get the right response at higher speeds and the ability to maneuver easily when you are traveling at low speeds. Even traveling on uneven roads is easier. 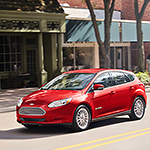 Visit Midway Ford Truck Center so you can see how it feels to test drive the new Ford Focus Electric.